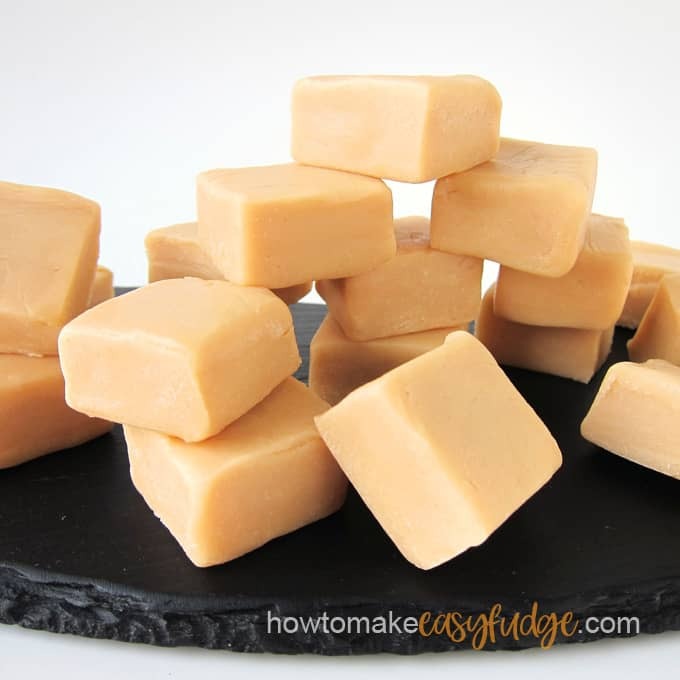 This Caramel Fudge gives you all the flavor you love in a good chewy caramel with the creaminess of a soft fudge and it can be made quickly in the microwave using just 3 ingredients. 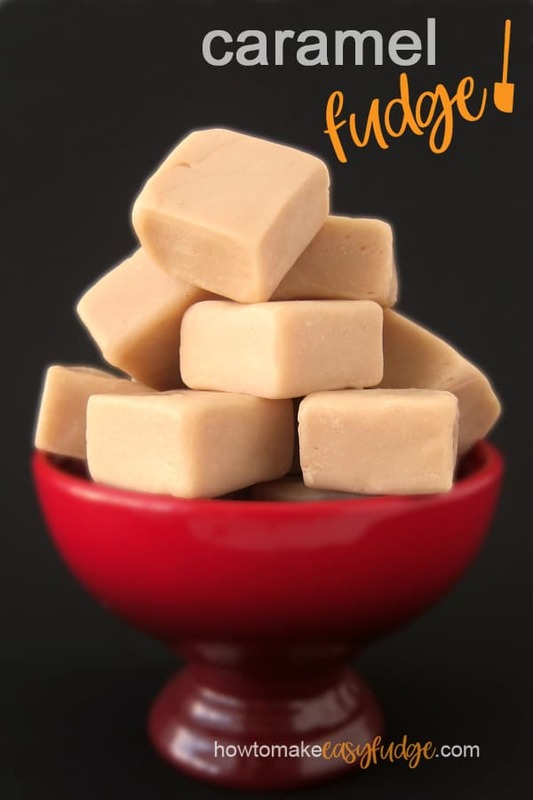 If you are like me and you love the flavor of caramel but hate that the candy sticks to your teeth, you have got to try this easy caramel fudge recipe. I am so excited that I can now enjoy the flavor of caramel without the sticky chew. I’ve been busy making so much delicious fudge recently that it’s hard to choose a favorite, but this caramel fudge is definitely at the top of the list. The caramel flavor in this homemade candy is really fabulous. This fudge is made by blending white chocolate with caramel ice cream sauce. 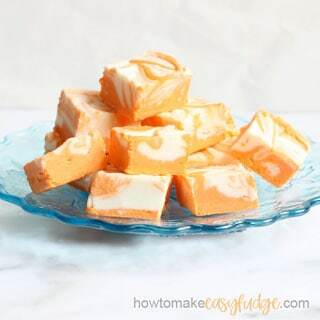 Although there is no actual ice cream in this recipe when you bite into a piece of this fudge it will taste very much like you are eating a spoonful of creamy caramel ice cream. To really enhance the flavor of this fudge you can add a sprinkling of salt. If you don’t really want to be smacked in the face with the salty flavor, you can blend a pinch of table salt into the fudge or sprinkle it over top. If you enjoy a bit of crunch and an intense contrast of sweet and salty, then sprinkle coarse pretzel salt over top. I went somewhere in between and added a light sprinkling of Kosher salt which has a finer grain than pretzel salt and a coarser grain than table salt. Watch this video to see how simple this caramel fudge recipe is to make. There are so many desserts you can make using caramel or caramel filled candy like Milky Way Caramel Cheesecake Brownies, Homemade Girl Scout Cookie Somoas, or Salted Caramel Chocolate Chip Cookies. I personally can’t get enough of the sweet creamy flavor of caramel and I’m so excited to share this easy fudge recipe with you. What do you need to make this caramel fudge recipe? Confectionery coatings swap out the cocoa butter used in making pure white chocolate for a vegetable oil (usually palm kernel oil) in order to make the candy easier to work with and they work just fine in most of the easy fudge recipes you’ll find here on this site, like Cookies and Cream Fudge, Vanilla Fudge, and Lemon Fudge. White chocolate is a bit softer than white confectionery coating so you’ll need to adjust the recipe accordingly. If using white confectionery coating chips (no cocoa butter listed in the ingredients) use 24 ounces, if using pure white chocolate (with cocoa butter listed in the ingredients) then use 28 ounces. I used Smucker’s Caramel Flavored Ice Cream Topping to make my caramel fudge. It’s a very thin caramel sauce and it worked perfectly to make a creamy soft fudge. This sauce is easy to find in most grocery stores. I also experimented with a jar of Fran’s Caramel Sauce, which was quite a bit thicker. It worked well too, but made a firmer fudge. So if you use a thicker sauce, just be aware that your fudge will not look as fluid as the fudge in the video above. If you want to make salted caramel fudge, add salt. I recommend you add at least a pinch of table salt just to balance the flavor. If you want a more intense salty flavor use kosher salt and use pretzel salt if you want to feel the crunch of the salt on top of your salted caramel fudge. 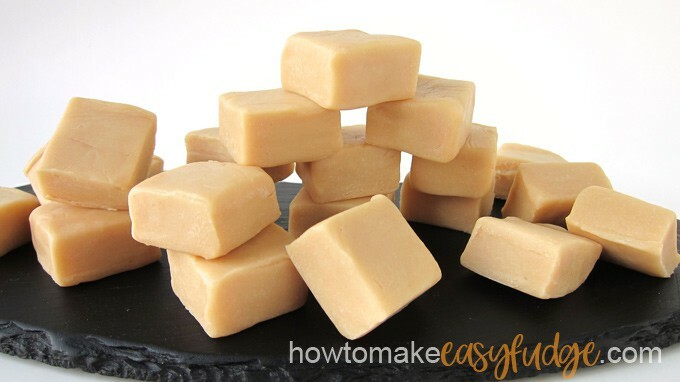 What else do you need to know in order to make this easy caramel fudge recipe? Just some basics, like how to line the pan, and how to store your fudge, and for how long. 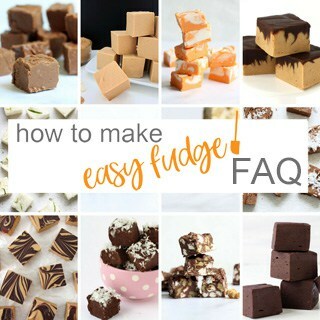 You can find all those answers on our Easy Fudge Recipe FAQ page. This caramel fudge would be amazing layered over top of some chocolate fudge. The flavors go so well together. You can find the ingredients needed to make this fudge on amazon (commission earned for sales). Note: If using white confectionery coating chips (no cocoa butter listed in the ingredients) use 24 ounces, if using pure white chocolate (with cocoa butter listed in the ingredients) then use 28 ounces. Line an 8 inch square pan with tin foil or parchment paper. Pour the white chocolate chips or white confectionery coating wafers and caramel sauce into a microwave safe mixing bowl. Heat at 70% power for 90 seconds. Let bowl rest in microwave for 3 minutes. Remove and stir until melted. If needed heat for another 15 seconds at 70% power. Let rest and stir. Pour the fudge into the lined baking pan. Chill in refrigerator for 3-4 hours. Remove the fudge from the pan and peel off the tin foil or parchment paper. As I mentioned above this fudge is soft. I highly recommend lining your pan with either non-stick tin foil, regular tin foil that has been sprayed with baking spray, or parchment paper that has been sprayed. You will easily be able to lift the fudge out of the pan in order to cut it. If after the 3 hour chill time you fudge is too soft or sticky, let it chill for another hour or so or set it at room temperature for another few hours to allow it to firm up. Letting it sit overnight will definitely help. Be sure to check out these other easy fudge recipes. Thanks for sharing some of this amazing caramel fudge with all of us! My coworkers thought it was the best fudge they ever tasted. It is so soft and creamy! I am so happy to hear everyone loved this caramel fudge. I was happy to share it with you all. Carmel is a family favorite and this is so simple it will become an often served desert. I am in love with this easy caramel fudge! I will be making this again for Christmas. Thank you for giving us such a great recipe. I am so glad! This caramel fudge will definitely make a wonderful Christmas gift or treat to serve after Christmas dinner. I hope your family and friends enjoy it too. I made this caramel fudge for my family and they loved it! Thanks so much for this easy fudge recipe. I’m so happy you enjoyed this fudge recipe! I still can’t believe this fudge is made using just 2 ingredients. We made it today and it turned out great. Thanks for such an easy recipe. I am so happy to hear you loved this easy caramel fudge recipe. It is amazing what 2 simple ingredients can create. This fudge was so amazingly easy to make and tasted incredible. I’m giving it as gifts for Christmas and know my friends and family are going to love it! I’m so happy to hear you enjoyed the flavor of this caramel fudge. I hope everyone enjoys their Christmas candy. I made this fudge for my family for Christmas and it was a huge hit. It’s soft and slightly chewy but not sticky. My mom has dentures and she hasn’t enjoyed caramel in a while. She said this was the best fudge she’s ever eaten. This caramel fudge was AMAZING! I loved how easy it was to make too. I would never have thought to use caramel sauce to make fudge and am so happy I tried this recipe. We hope you enjoy this caramel fudge! This is the best fudge ever!!! I love caramel and fudge and the two together are totally the bomb. I’ll be making this again and again for years to come. I’m so glad I found your website. Thanks! We are so happy you enjoyed this fudge recipe. My daughter and I made this fudge for Christmas and everyone loved it! It has a great caramel flavor. It was a bit soft but we layered the fudge in wax paper in Christmas tins which worked great. Once the fudge dried a bit it has the perfect texture. I am so happy to hear you and your family and friends enjoyed this caramel fudge! It’s one of my favorite recipes. I can’t believe how easy this fudge was to make. The caramel flavor was really great too. It was a little sticky. I’d say the texture was somewhere between caramel and fudge. Glad to hear you enjoyed this fudge recipe. It’s definitely a combination of caramel and fudge. I love that I can enjoy the caramel flavor without the candy sticking to my teeth. I just finished cutting my batch of caramel fudge and it tastes soooooooooooooo good! I can’t believe how easy this fudge was to make. I did use the Nestle white chocolate chips and it worked perfectly. Thank you for all your great tips. 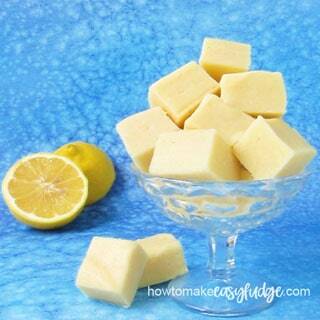 I’m so glad you liked this fudge and that you found it really easy to make.